There are hundreds of health products on the market claiming to be the secrets to good health and well-being. With so many choices, it can be hard to know which ones are right for you, and even harder to consume all the pills, powders and juices they say you need to be healthy and feel great. least one serving a day to get all the nutrients, antioxidants and vitamins your body needs. Zeal dissolves easily, tastes great and helps you recapture your youthful Zeal for life. Enriches your body for optimal health with whole food concentrates. Zeal for Life Drink has a complete spectrum of nourishment from whole food concentrates that deliver the best nutrition nature has to offer. These natural botanicals and plant extracts feed your body with essential nutrients. Restores your body’s energy with powerful antioxidants and amino acids. Zeal’s blend of nutrients is packed with antioxidants, amino acids and special mixture of herbs specifically designed to induce your body’s own natural antioxidant enzymes (including super oxide dismutase blend) to restore your cells to a youthful state. Protects your youthful Zeal for life with complex carbohydrates and polysaccharides. Zeal for Life drink contains a blend of complex carbohydrates and polysaccharides that support your immune system and help protect your body from environmental stress. 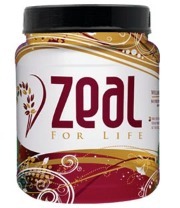 Zeal for Life Drink has well over 1000 Central nutrients including nutritional superstars such as rice bran and Albert a that were synergistically to enrich, restore and protect your body. Found in the richest and most unspoiled soils on the planet, these extraordinary whole food and plant extracts have been brought together into a unique, all in one wellness formula of vital nutrients to support your immune system and restore you to the state of youthful vigor. A well-nourished body is a healthy body, and Zeal for Life Drink is the ideal way to supplement your diet to get health enhancing nutrients. If you consume zeal on a daily basis, you may see distinct improvements in your health and well-being, along with dozens of other noticeable benefits. Zeal for Life Drink is a concentrated, powdered, nutritional formula you can mix with water or juices or blend into your favorite shakes. It has an invigorating, wild berry flavor that works great as a morning wake-up, afternoon refresher or tasty evening treat. Zeal contains no artificial sweeteners, so there’s none of the aftertaste, bitterness or over-sweetness found in many other health drinks. And because Zeal for Life Drink’s powdered formula comes in a vacuum-sealed canister, it’s always fresh, has a shelf-life of 18 months and maintains its potency much longer than liquid formulas. We’re so confident in Zeal for Life Drink’s health benefits that if you don’t feel better after drinking it regularly for 30 days, we’ll give you your money back. We offer this guarantee because we know Zeal’s full spectrum of nutrition is sure to restore your Zeal for life! Try Zeal for Life Drink Today.